Ah, traditions, such a wonderful thing! 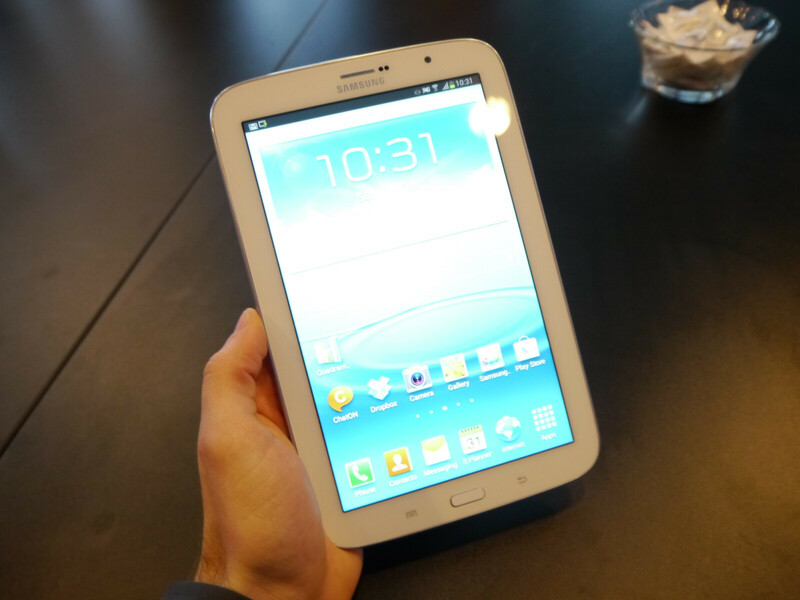 Samsung used last year's MWC as a stage to announce the Note 10.1 tablet, so it was only fitting for us to see another Note device at MWC 2013. Enter the Galaxy Note 8.0, which will proudly take the empty seat between the Note II and Note 10.1 as a compact tablet designed to be used with a special stylus, which Samsung lovingly calls "S Pen." To tell you the truth, this was probably one of the worst kept secrets of our time, as practically everyone knew what Samsung was to unveil here in Barcelona. Anyways, let's get right down to it! The Samsung Galaxy Note 8.0's design language is obviously inspired by the Note II, as it has the same rounded corners and overall elegant styling. The device is quite thin, as we'd expect from a modern Samsung device, and the casing is made from the familiar glossy plastic, which might be a fingerprint magnet, but feels very good to the touch. 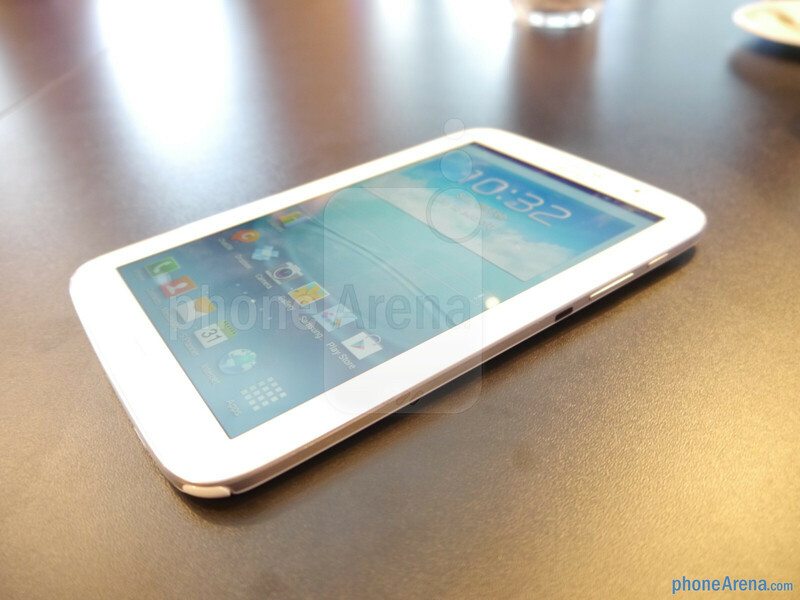 The front side is dominated by the 8" display, which has a resolution of 800x1280 pixels. The display isn't bad, but the 189 ppi pixel density leaves a lot to be desired. Still, it's a bit better than the iPad mini's 162 ppi, which can be seen as a direct competitor to the Note 8.0. Oh, and by the way, it's an LCD screen, so don't expect the super-dynamic visuals found with Samsung's AMOLED-powered devices. Always a key feature of the Note series, the S Pen is once again present in the Note 8.0 to allow you to easily take notes, or even do some basic drawing. The size of the pen is quite similar to the one inside the Note II, which means it's quite comfortable to hold, although it probably would have been even better if it was just a tad bigger. Anyways, the S Pen stylus seems to work very well and it's once again pressure-sensitive. We did run into some trouble when trying to write with the stylus touching the screen at an angle, but we should keep in mind that what we tested was a pre-production model, so this may be fixed in the retail one. We'll know for sure when we get our final, retail unit for review. The tablet is equipped with Samsung's Exynos 4 quad-core processor, clocked at 1.6 GHz, and thankfully, this tried and true piece of silicon is capable enough to keep the Note 8.0 moving at a steady pace. Throw in 2 gigs of RAM and you can be sure that it'll be pretty hard to slow this device down. Indeed, while we were testing the tablet, we found the UI to be very smooth. Samsung's Galaxy Note 8.0 will come in 16 and 32 GB flavors, but of course, being a Samsung device, it also features a microSD card slot allowing you to easily expand your storage. 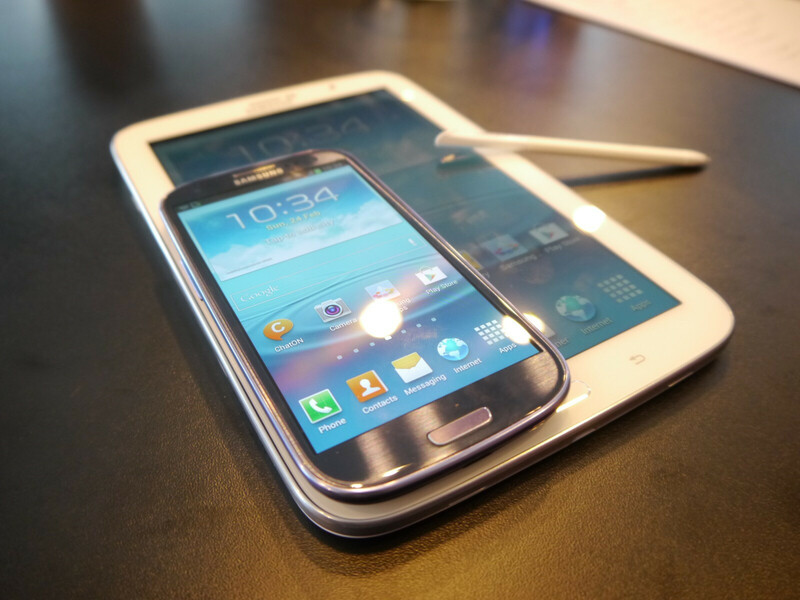 Samsung is doing a marvelous job lately with the software on its devices. New models are always coming with the latest version of Android, and subsequent updates for the top models are usually issued on time.Unfortunately, that isn't quite the case with the Note 8.0. 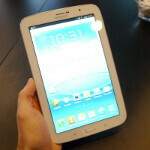 The tablet will come with Android 4.1 and will get an update to 4.2 afterwards. That's not such a big issue, because Android 4.2 didn't really introduce anything groundbreaking. Sadly, Samsung isn't ready yet to reveal any specific release date information, and the same goes for pricing; however, we know that the Note 8.0 is scheduled to launch sometime in Q2 2013. Seems like a winner to me! and improved S-Pen just sweetens the deal! They should put some effort in new design, it is getting boring. It is boring and UGLY, gosh really awful! okay you make one and let us judge your "original design"
Yes. True. But I guess Samsung wants to completely stay away from Apple-patended-rounded-corner designs. Also, I think they feel as long as the design is selling, they don't want to change it. As the saying goes -- "If it ain't broke, don't fix it"
performance and features are everything for me.. yeah note 8.0 definitely not a good looking device.. but that's the reason why i never choose nokia wp.. i don't need good looking phone but inferior OS..
inferior OS is your opinion but cheap made products are a fact coming out of SS... I don't expect anything less coming out of Korea though. Personally, I'm ok with the bezel. On a phone a small bezel is good as the phone sits in your palm so your thumb doesn't touch the device when you're just holding it. When holding a tablet, you tend to need to put your thumb on the front to balance it. The bezel size allows the thumb to be placed on the device without putting finger prints on the screen. If it has touch rejection, it doesn't need that bezel. The iPad Mini has a thin side bezel because it has that, but this isn't even about Apple vs Samsung, because Sammy uses the same technology on the N1 & N2. If this can make phone calls I'm ditching my Note II! lol. This is fantastic Sammy! Amazing design! Other tablets cannot compare!! I read the benchmark and the fact that it outdone HTC one was just shocking!! You HTCfanboys and wp7fanboys just stop wining! Why is this douche bag still doing reviews and hands on on ANDROID for? they need too get rid of RAY S. period. BUT STILL l love the international version with the SIM CARD SLOT. Ray S. great review as always. Keep em coming.